Mexican artist Dalton Javier Avalos Ramirez said Trump's characteristic hairstyle was the hardest detail to copy. 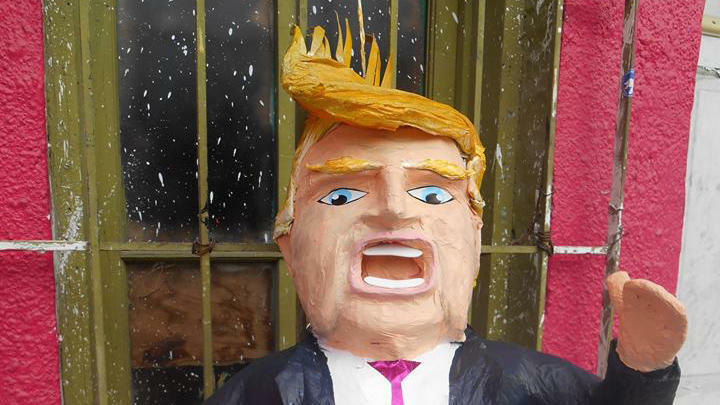 If you’ve ever wanted to take a swing at presidential candidate Donald Trump, one Mexican artist will give you that chance — in the form of a piñata. The bombastic real estate mogul has been fired by Univision, NBC Universal and now Mexico's Ora TV after slamming Mexican immigrants to the United States. No more Trump means no broadcasts of his "Miss USA'' or "Miss Universe pageants on those networks; no more episodes of "The Apprentice;" no more Trump partnership with Mexico's TV billionaire, Carlos Slim. And no more Mexican contestant either. Mexico announced on Monday that it would pull its contestant from the "Universe" competition, and on Tuesday a third co-host bowed out of the "Miss USA" show. As Trump might say, every moment is a business opportunity. The brewery 5 Rabbit Ceveceria has received widespread publicity after pulling its beer from the Trump Hotel bar in Chicago, and artist Dalton Avalos Ramirez has been building piñatas for smaller-scale swings. The piñata is complete with Trump's classic swooping hairstyle. Avalos Ramirez has made piñatas that look like Miley Cyrus, after she had dancers spank her with the Mexican flag on stage on the country’s Independence Day. He’s also created ones that look like Kim Kardashian and, more recently, Caitlyn Jenner. Trump is unlikely to back down from his staunch anti-Mexico stance, but he did tweet this message on Friday. I like Mexico and love the spirit of Mexican people, but we must protect our borders from people, from all over, pouring into the US.